Rhodes today is making the same kinds of coaching decisions, something he's been doing for the past 10 years, as head coach of his McLennan Community College in his hometown of Waco, Tex. 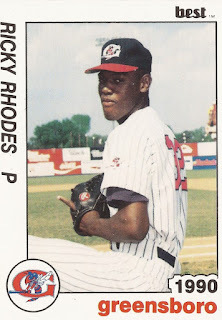 His baseball days over, Rhodes went back to school, attending McLennan, then San Antonio's University of the Incarnate Word and switching to basketball and playing at both schools. He returned to McLennan in 1995, becoming an assistant on the men's basketball team. It was in 1999 that he took over the woman's team, a post he still holds in 2015.